Flotype, a 2010 Y-combinator startup, is hiring techies to help it build infrastructure for creating real-time web applications. It’s looking for high-level systems engineers with experience in Node.js as well as other languages. “The reason Node is taking off in the enterprise is the same reason we use it. It is, from the ground up, a non-blocking, evented solution. If you build infrastructure that’s great and the corollary is if you prototype an app, it’s really easy to do very quickly,” said Darshan Shankar, CEO and co-founder of the Berkeley, Calif. company. The ad claims that the company’s technology is already used by startups as well as media giants, communications companies, and universities. Initial target vertical markets include logistics applications like fleet management, supply chain management as well as chat and messaging and MMO gaming. According to the company’s web site, Flotype’s product, called Now, can handle 10,000 concurrent users and “X messages” on a single process — something that Node.js enables. For those needing to scale beyond that, the commercial NowCluster version takes care of that in a way that the developer is insulated from whether the code runs on a single or hundreds of machines. As more proof of Node.js momentum, it recently surpassed Ruby on Rails to become the most popular code repository on the Github site with 11,460 watchers compared to 11,274 for Ruby on Rails. For Jason Hoffman, CTO and founder of Joyent, the San Francisco company that built, championed and open-sourced Node.js, all this recognition is nice but hardly surprising. And he definitely would not put Node.js in the same category as the Ruby on Rails framework. 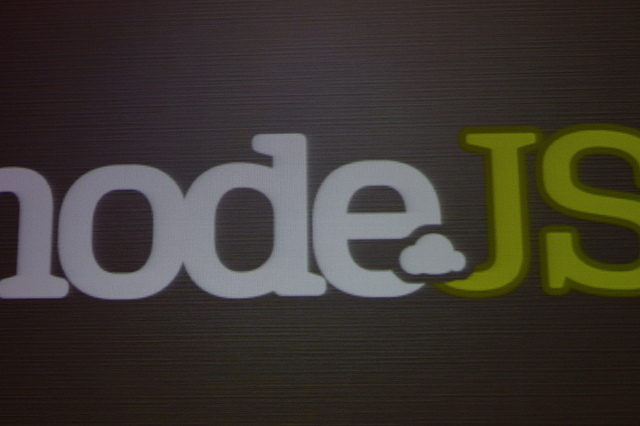 “Node.js is meant to be a data pipe …. a way to write really high-performance servers and to perform things like API input, data ingress and egress — in and out of data stores very fast. People use Ruby to write web apps,” Hoffman said. In his view, Node.js is already embedded in the enterprise. It also got a big endorsement this week when Ebay (s Ebay) announced ql.io, a data-retrieval and aggregation gateway for HTTP APIs that uses a Node.js-based runtime to process scripts written in that language. In a blog post, Allamaraju explained why Ebay went with Node.js as opposed to a more “proven” Java stack that already had full operational support within the company. The upcoming Node Summit 2012 in January features corporate users including Emerson IT and Sabre. With those reference accounts plus eBay and others, it seems pretty clear that Node.js is well on the road to corporate acceptance.